In Cappy Town in the anime, NME has sent a giant Meteor to crush the planet in an desperate effort to kill Kirby, pretty much taking him and everyone with him. Here's King Dedede enjoying his last moments in Cappy Town with Kirby by destroying a statue he selfishly built for himself, and replaced it with a Playground for Kirby. This is one of the few times Anime Dedede actually shows kindness to Kirby. 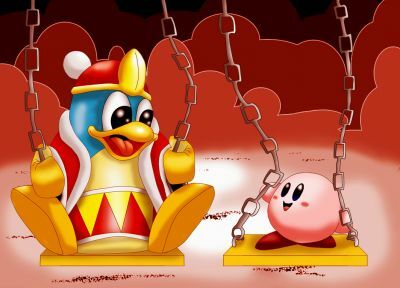 Still, regardless, I don't care for Anime Dedede too much, wish he wasn't so malicious to Kirby.